Today we realised our very first turbine. N°1 of 44 turbines is installed in the North Sea. 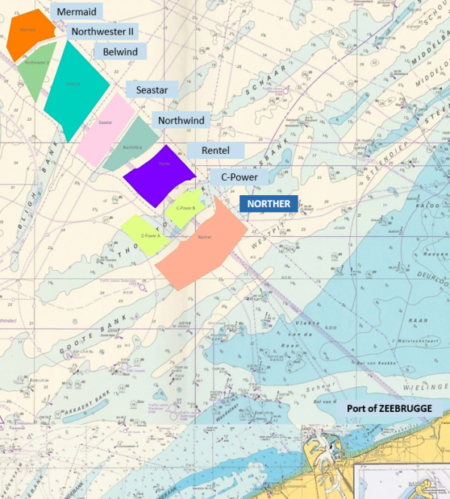 Norther is an offshore wind farm – a total of 44 wind turbines – with a maximum capacity of 370 MW that is currently being build in the Belgian North Sea, within the Exclusive Economic Zone of Belgium, approximately 23 kilometres from the Belgian port of Zeebruges. The concession was granted at the end of 2009, which is when the actual development of the Project began. The shareholders in this project are all parties with the necessary expertise and experience in developing renewable energy projects. Norther is ultimately owned by three parties: Belgian Elicio – a Belgian renewable energy producer operating internationally (50%), Dutch Eneco – a major producer and supplier of renewable electricity, natural gas and heat in the Netherlands and Belgium (25%) and also Diamond Generating Europe (25%). 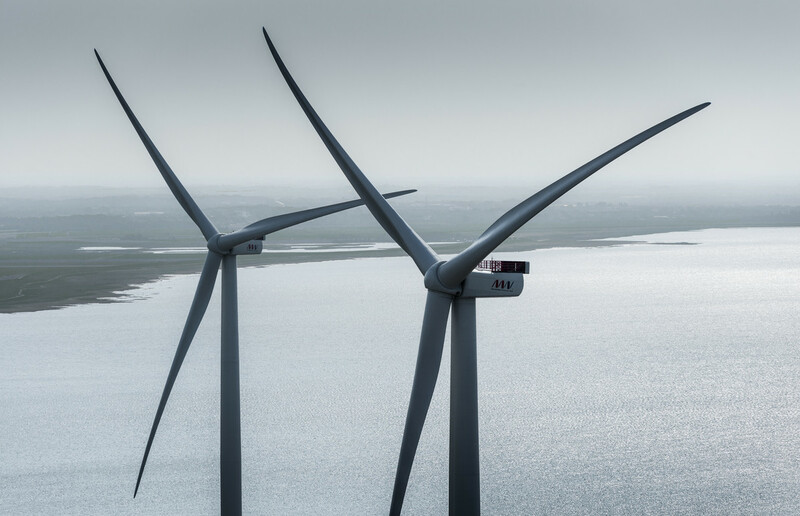 Offshore wind is expected to be a key pillar of Belgium’s future energy mix and is projected to represent around 10% of total generated electricity by 2025. 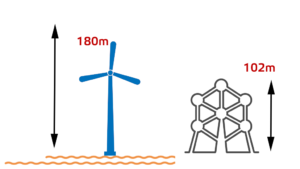 The Norther wind farm is being build 23 km from the Belgian coast, within a zone southeast of the Thornton Bank, alongside the border with the Netherlands. It stretches out over a total surface of 44 square km. Each year, it will generate 1,394 GWh of sustainable energy, equal to the energy use of almost 400,000 families. The Norther windfarm is situated 23 km from the coast, southeast of the Thornton Bank alongside the border with the Netherlands. The Norther Project is situated at the most southeastern part of the demarcated zone for wind farms as designated by the Royal Decree of May 17th 2004, modified by the Royal Decree of February 3rd 2011. The northern border of the project area is situated at approximately 1 km from the concession domain of C-Power. The development of The Norther Projects dates back to 2008 when a concession application was submitted by Air Energy, a subsidiary of Eneco. The concession was granted at the end of 2009, which is when the actual development of the Project began. The Norther windfarm will be built at approx. 23 km from the Belgian coast, within a zone southeast of the Thornton Bank, alongside the border with the Netherlands. Norther benefits from experienced Sponsors with significant expertise, who have been able to provide project team members with highly relevant expertise from previous roles in both Belgian and non-Belgian projects . Nethys SA: is a 50% shareholder via its daughter company Elicio NV, a Belgian renewable energy producer operating internationally. energy, telecommunication and the industrial development sector. Belgium, and Elicio was actively involved in the development of Northwind. (including two operational offshore wind farms in the Netherlands – Princess Amalia and Luchterduinen). Mitsubishi Corporation: 25% shareholder via its daughter company Diamond Generating Europe (DGE). DGE is a wholly-owned subsidiary of Mitsubishi Corporation (“MC”). 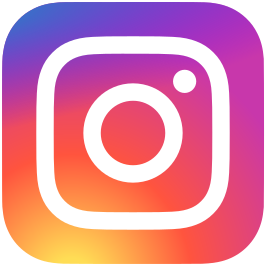 MC is a global integrated business enterprise that develops and operates businesses across virtually every industry, including industrial finance, energy, metals, machinery, chemicals, and daily living essentials. MC’s current activities have expanded far beyond its traditional trading operations to include investments and business management in diverse fields including natural resources development, manufacturing of industrial goods, retail, new energy, infrastructure, finance and new technology-related businesses. The EU environmental policy is based on 2 main principles: first of all the reduction of CO2 and second the strengthening and growth of sustainable energy sources. Offshore windpower can contribute significantly to achieving the EU goals of renewable electricity, halting global warming and reducing our dependence on coal, oil and gas. However, minimizing the environment and environmental impact of the construction works and operations is a key element for Norther. In order to obtain this objective, an environmental monitoring programme will be setup in close collaboration with the MUMM to monitor and provide continued protection to vulnerable coastal and marine habitats. In close cooperation with the MUMM (Management Unit of the North Sea Mathematical Models and the Scheldt estuary) which is part of the Royal Belgian Institute of Natural Sciences, the installation and operation process will be continually monitored. Preventive actions will be taken to minimise the environmental impact during construction and operation. All main permits required for the construction and operation of the wind farm have been obtained. 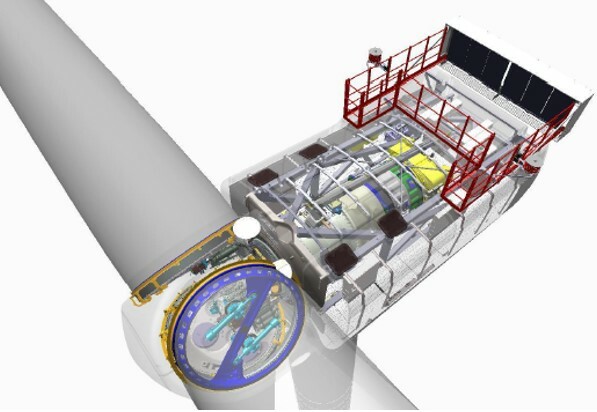 With the V164-8.0 MW, MHI Vestas Offshore Wind proposes a wind turbine generator (also referred to as WTG) designed for high efficiency and high reliability specially designed for and tested for the harsh conditions of the North Sea, benefitting from the lessons learnt from previous models and a high quality production process. The V164-8.0 MW has been designed to have a long structural design life, minimal maintenance requirements, and to allow for safe, cost-efficient servicing. The V164-8.0 MW has obtained an A-type certificate from Det Norske Veritas Germanische Lloyd (“DNV GL”) for the rotor and nacelle assembly. The rotor of the V164-8.0 MW is three-bladed and mounted upwind of the tower. The power output is controlled by pitch regulation and the rotor speed is variable and designed to maximise the aerodynamic efficiency. Its hybrid generator uses both a 3-phase synchronous generator as well as a permanent magnet rotor, and is connected to the grid through a full scale power converter. The WTG benefits from true variable speed, but with the higher rotational speed of the generator the volume of the permanent magnets can be limited. It thus combines the advantages of conventionally geared and direct drive WTG’s. The concept of the three stage differential gearbox is similar to MHI Vestas Offshore Wind previous designs for the V112-3.0 MW. The generator has also benefited from MHI Vestas Offshore Wind s experience, as windings and arrangement are similar to the V112-3.0 MW generator, but at a slower speed. Finally, with a horizontal split in the drive train, easy-access components, and the possibility of separately lifting out the main bearings, coupling, gearbox and generator, the V164-8.0 MW design is geared towards maximum servicing efficiency. The design of the medium-speed three stage differential gearbox is similar to MHI Vestas Offshore Wind previous designs for the V112-3.0 MW and the V90-3.0 MW platforms, without the high speed stage. The generator has also benefited from MHI Vestas Offshore Wind s experience, as windings and arrangement are similar to the V112-3.0 MW generator, but at a slower speed. MHI Vestas Offshore Wind has had problems with its gearboxes in the past and these are associated with the V90-3.0 MW WTG’s. It should be noted that by reverting to a medium speed gearbox in the V164-8.0 MW the risk of gearbox failures has significantly been reduced. Finally, with a horizontal split in the drive train, easy-access components, and the possibility of separately lifting out the main bearings, clutch, gearbox and generator, the V164-8.0 MW design is geared towards maximum servicing efficiency. Monopile (MP) foundations have been installed across the vast majority of offshore wind farms and are considered proven technology. a tubular TP, which extends to approximately 17.5 metres above Lowest Astronomical Tide (LAT). The use of an MP enables shorter fabrication periods, easier offshore logistics and installation periods and ultimately lower capital expenditure than jackets or tripods. Supply chain risks are also lowered as a range of experienced manufacturers in Western Europe can fabricate the required MP/TP structure. Furthermore, the offshore handling and transport of MPs can typically be more efficiently achieved than with jackets or tripods as a greater number of MPs can be positioned on the deck of the installation vessel or supply barge. Norther intends to use a bolted flange connection between the MP and TP (Transition Piece) between seven and eight metres above LAT level. It is highly preferable to use bolted connections over grouted connections as slippage problems occur in some operational wind farms with cylindrical grouted connections. Based on current estimations, MP weights are expected to vary between 670 and 963 tons with a diameter of 7.2-7.6 metres, depending on the individual Wind turbine generator location with an average weight of 795 tons and diameter of 7.4 metres. As can be seen from the table below the weights and diameters are well in line with market practice. This has to do with the location of the wind farm (close to shore, water depths 16-33m, and easy to penetrate the soil conditions (mainly sand). 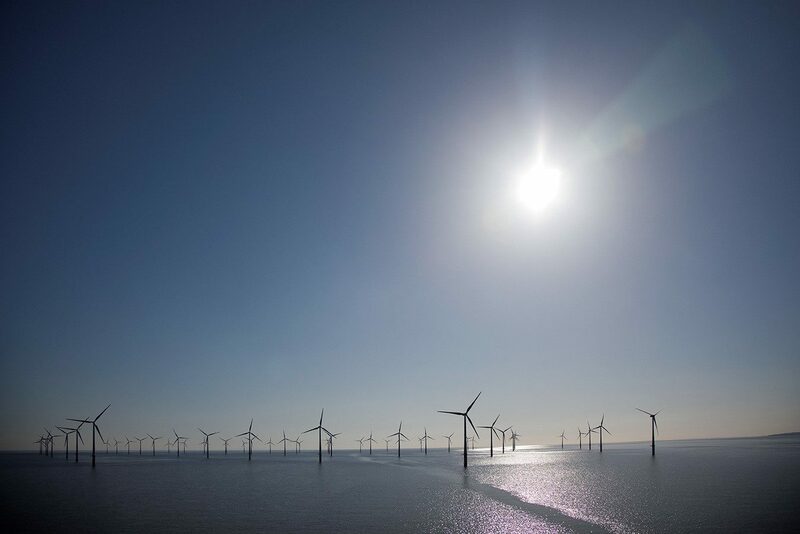 All WTGs will be connected to the wind farm’s Offshore High Voltage Station, or OHVS, which will collect the electrical energy of the wind farm and transform it from 33 kV to 220 kV for export into the grid via the single export cable. 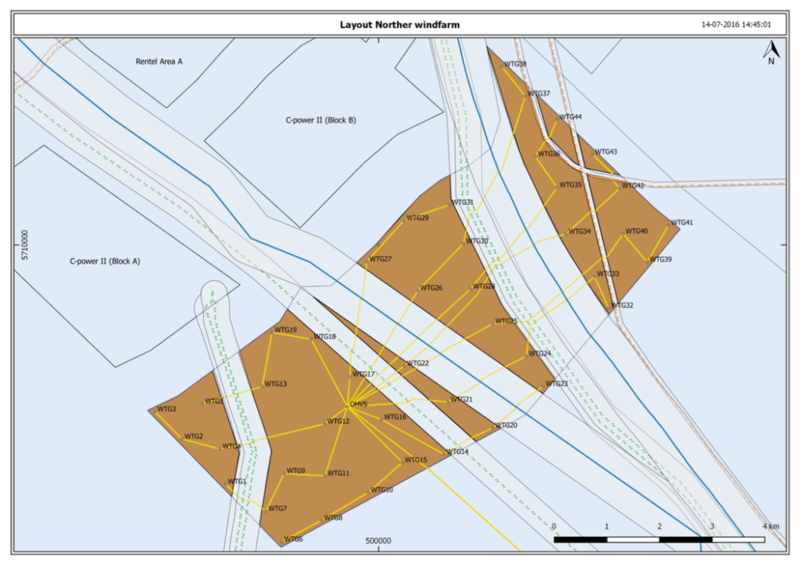 The OHVS will be located southwest of the geographical centre of the wind farm area in a water depth of approximately 26.5 m, and will have a MP foundation, which has been commonly used for OHVS structures. The WTGs will be connected to the OHVS through approximately 70 km of 33 kV aluminium AC subsea array cables with cross-sections between 185 mm² and 800 mm². Each inter-array cable consists of three power cores and one optical fibre unit for communication and control purpose. The electrical energy generated by the WTGs and collected by the OHVS will be transported via a single 26 km, 220 kV AC submarine export cable to the Beach Pit. It will then be connected to the onshore cable by Elia, who will also install, own and operate this section along with the Stevin assets. We are constantly looking for high achievers and young potentials to join our organization. Do you have experience in the operations & maintenance of an offshore wind farm? Are you interested in renewable energy? And are you eager to play an important role in the further expansion of the offshore wind energy in Belgium? Apply now! Send spontaneous your CV and motivation letter to info@norther.be, and become part of a professional and result driven team where safety, health, environment and team spirit are key. BOP combines the leading Belgian players who invest in renewable (wind) energy in the Belgian North Sea. Researching on renewable (wind) energy generated at sea. The CREG is the federal body regulating the gas and electricity market in Belgium and that advises the competent minister on the granting of concessions for wind farms in the North Sea. The VREG or Vlaamse Reguleringsinstantie voor de Elektriciteits- en de Gasmarkt (Flemish Electricity and Gas Market Regulator) is responsible for the regulation, the control and the promotion of transparency of the energy market in the Flemish Region. Elia is Belgium’s high-voltage transmission system operator (30 kV to 380 kV), operating over 8,000 km of lines and underground cables throughout Belgium. ODE, the Organisation for Sustainable Energy, is the sector organization for renewable energy in Flanders. ODE brings together more than three hundred companies, research centres, universities and organizations in technology platforms and working groups, to exchange knowledge and promote their interests. ODE is the main stakeholder of renewable energy to the authorities concerned. Van Oord is a leading global contractor in dredging, hydraulic engineering and offshore projects (oil, gas and wind). We are an innovative partner for our clients and have been contributing to the infrastructure of tomorrow’s world for over a hundred years. Our people are committed, enterprising professionals with a passion for water and technology.